Dr. Paul S Thaler, MD is a Doctor primarily located in Florence, MA. He has 44 years of experience. His specialties include Family Medicine. He speaks English. Dr. Thaler has received 2 awards. The overall average patient rating of Dr. Paul S Thaler is Great. Dr. Paul S Thaler has been rated by 7 patients. From those 7 patients 1 of those left a comment along with their rating. The overall rating for Dr. Paul S Thaler is 4.1 of 5.0 stars. has no bed side manner,and no tact.does not spend time with patients.its a quick thing not even 10 min in office. i think dr thaler is not very good, the reason why is that you dont call a patient,at 8am and tell him,or has his nurse call,and tell you that u have a spot on your x-rays and he wants to give the patient 3 months to take another x-ray.he has no bed side manner,or tact...i wouldnt send my dog there.i dont care how small the spot on your chest, it should have been checked anyway,seeing that there is a history of cancer in the family.and you definatly dont make that patient wait for 3 months for another x-ray.i feel that he should have called my husband, in and took a look at the x-ray together and let my husband at least take a look, but no he made him hang.my opinion is that this doctor,stinks as a doctor.and should be reported for neglect.i told him that if anything happens to my husband,that he will definaely hear from me.i will be a thorn in his side. this is what i told his nurse that called.i asked her if she would deal with that and she said no..my doctor told me that no matter how small he would give him a catscan, you never know what could happen.im very angry,and upset. it doesnt matter if he didnt think it was important, my husband did.we had a very bad day,my husband, was upset, and scared,and he couldnt even turn to his doctor for help..
Dr. Thaler is board certified in family practice. He graduated with a B.A. from Brown University and received his medical degree from the State University of New York at Buffalo. Dr. Thaler completed his residency at the University of Maryland Hospital. Formerly, he was in a private practice in York, Pennsylvania and practiced family medicine at Wing Memorial Hospital Health Center in Belchertown, Massachusetts and worked in their Emergency Room in Palmer, Massachusetts. Dr. Thaler is affiliated with Cooley Dickinson Hospital. He has been a member of the Valley Medical Group (formerly the Massachusetts Permanente Medical Group, associated with Kaiser Permanente) since 1982. Take a minute to learn about Dr. Paul S Thaler, MD - Family Medicine in Florence, MA, in this video. Dr. Paul S Thaler is similar to the following 4 Doctors near Florence, MA. 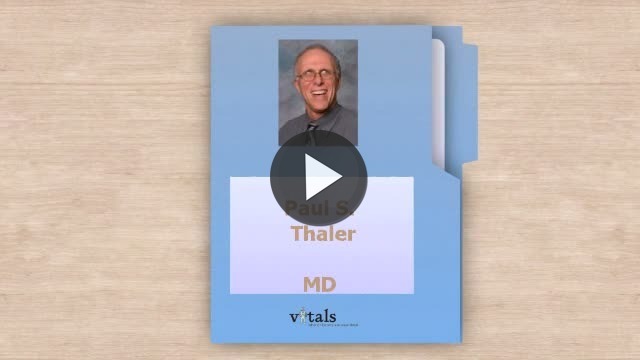 Have you had a recent visit with Dr. Paul S Thaler? Select a star to let us know how it was.